A truck filled with Catholic Charities staff rumbled down a rural country road with nothing in sight except the lush greenery of ripened crops covering vast fields and the deep blue sky above. From the seemingly endless farmlands, one would expect residents of the county to have an endless bounty of fresh fruits, vegetables and healthy food. But the reality of food insecurity, or a lack of access to adequate, nutritious food, in Salem County is sobering. “The county’s statistics show the cyclical relation between food insecurity and poverty. One in seven people is food insecure in Salem County; 12.5 percent of households are receiving Food Stamps; 13.5 percent of the population is below the poverty line, and the county is also ranked the third least healthy county in the state,” explained Cristina Chillem, program coordinator of Salem Health and Wellness Program, during the bumpy ride. “This means people can only feed themselves and their children the cheaper, processed snacks from corner stores, and the obesity, diabetes, and emergency room visits that result as a consequence increase their financial burdens further while decreasing their quality of life even more. Fearfully, with the recent closing of yet another grocery store, Salem City is officially a food desert,” she said. 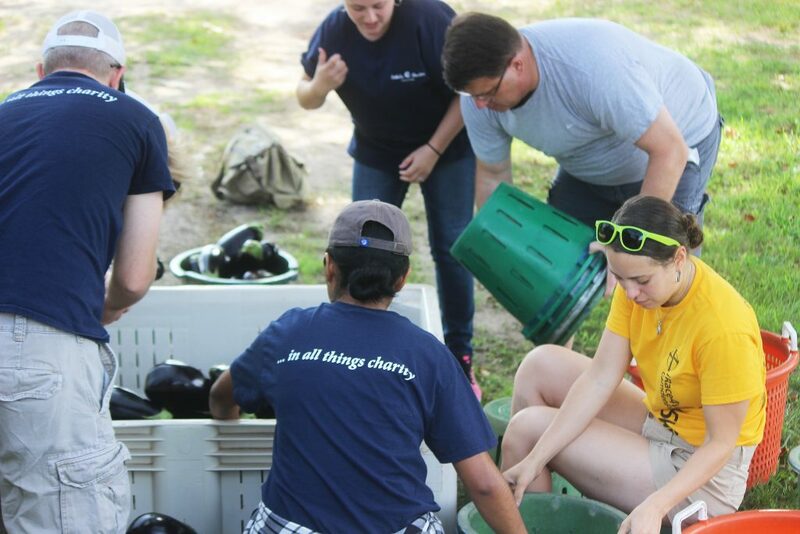 And so on this day, a team of Catholic Charities workers donned jeans and work boots, rolled up their sleeves and headed to Salem County for Catholic Charities’ annual Staff Gleaning Day. 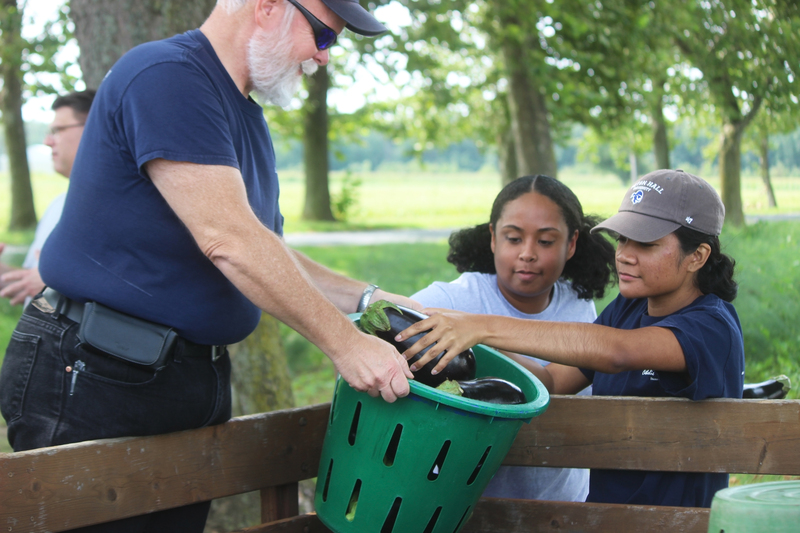 It’s a day in which staff members from almost every program, from case managers to financial coaches, suspend their usual duties and spend a day in the fields for a hands-on experience in harvesting fruits and vegetables for food insecure residents of Salem County. Chillem explained the meaning of gleaning: collecting leftover crops from farmers’ fields after they have been commercially harvested. The crops collected are not able to be sold commercially because they might be too small or misshaped, but they are perfectly edible. Catholic Charities is part of a collaborative led by the nonprofit organization, Bushels of Blessings, led by founder and director Michele Montemurno. 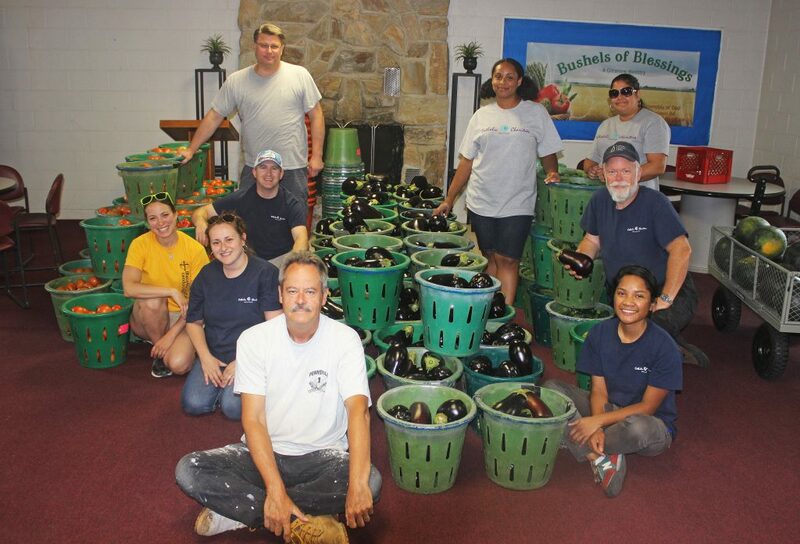 From late May through August each year, Bushels of Blessings oversees the gleaning of thousands of pounds of fresh produce that would otherwise be thrown away, and distributes it to over 50 emergency food relief organizations, including Catholic Charities food pantries in Salem City and Penns Grove. “Gleaning reveals the urgency of Salem County’s need. 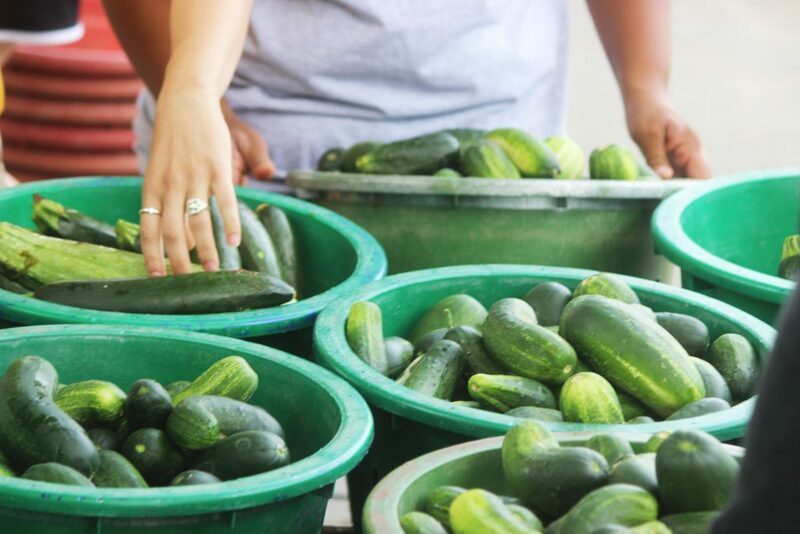 It is a labor-intensive and time demanding process— sitting on buckets, picking up one cucumber or eggplant at a time, checking it for soft spots and seeping cuts, loading full buckets onto a truck, taking the truck back to the distribution site, heading back out to another farm. Yet these efforts make fresh produce accessible to hundreds of families on a weekly basis,” explained Chillem. 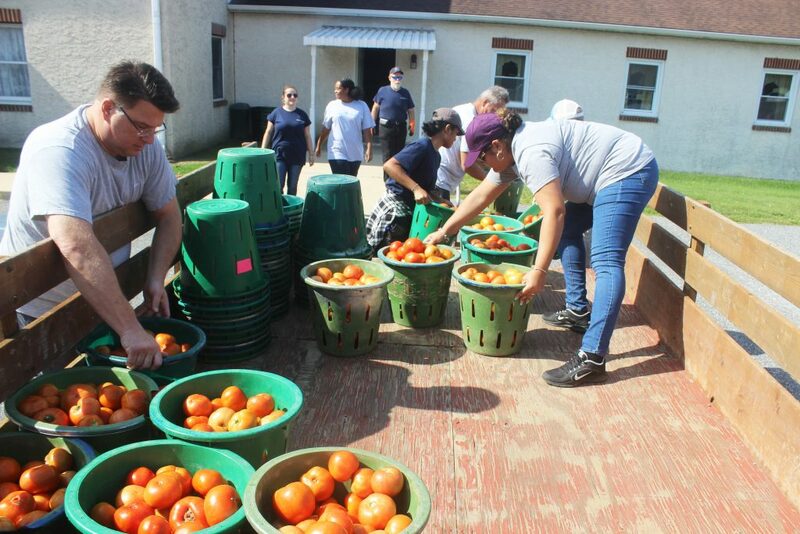 Over the course of the day, Catholic Charities staff travelled to five different farms across Salem County, gathering and sorting through various crops. Over 100 baskets of tomatoes, eggplants, zucchinis, cucumbers and other vegetables were collected. Gleaning requires coordination from various groups: farmers willing to participate in the program, volunteers to do the field work, and food pantries willing and able to accept fresh produce. 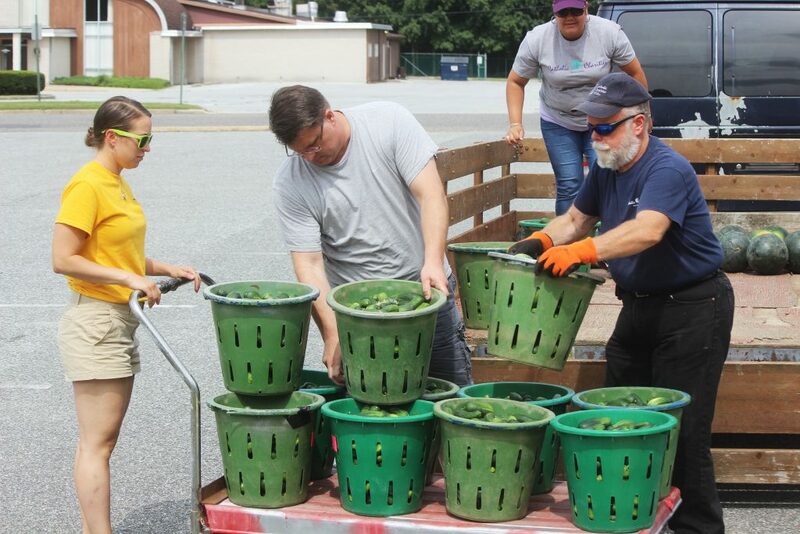 Assuring the smooth transportation of these gleaned crops was Bushels of Blessings volunteer and truck driver Dan Saxvanderweyden, who was grateful for the Catholic Charities special trip to Salem County. “I know you all have busy schedules, and I’m grateful that you all came today. And I can see that you’re doing this with joy in your hearts. I don’t always see that,” he said, smiling while driving the truck to the final farm of the day. Catholic Charities Salem Health and Wellness Program coordinates a variety of initiatives to help meet the nutritional needs of Salem County residents struggling against food insecurity. By definition, food insecurity means, first, nutritious foods are regularly inaccessible and consequently, second, healthy eating habits and healthy lifestyles are nearly impossible to maintain. These two challenges threaten the immediate and long-term quality of life for Salem County residents individually and as a community. The gleaning initiative is just one way the Salem Health and Wellness Program is combating the food insecurity plaguing Salem County. Catholic Charities also founded and is currently the lead organization of the Emergency Food Relief Providers Coalition. 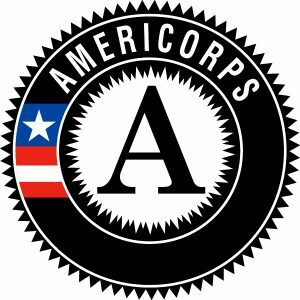 The program also coordinates nutrition education workshops as well as outreach efforts at food pantries and in the community to support enrollment in SNAP (Supplemental Nutrition Assistance Program).